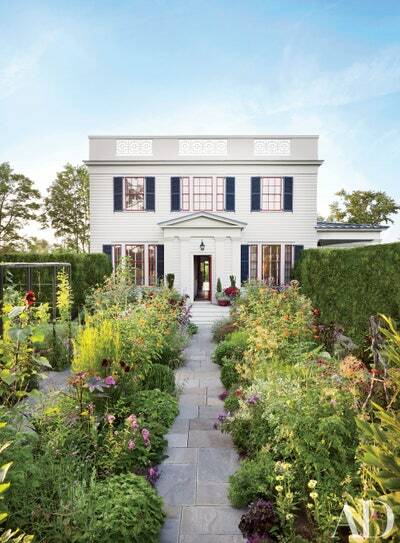 Photo: Pieter Estersohn1/36A bluestone walkway leads through the flower garden to the Greek Revival dwelling, in Millbrook, New York, which was designed by architect Peter Pennoyer and decorated by Katie Ridder. Photo: Scott Frances2/36Architect Arthur R. Kelly designed the 1930 half-timbered Beverly Hills, California, dwelling, christened Nine Gables; its brickwork and stucco are painted in Farrow & Ball’s Hardwick White. Photo: Luke White3/36The exterior of a late-Georgian London residence by Thomas Croft is white stucco. COPYRIGHT ©2012 THE CONDÉ NAST PUBLICATIONS. ALL RIGHTS RESERVED.4/36The architecture, interiors, and landscape design of Helen and Jeremy Parfit’s Southampton, New York, residence are all by Manhattan firm Sawyer|Berson. The shingled façade is painted in a Benjamin Moore white, and the windows throughout the home are by Kolbe Windows & Doors. COPYRIGHT ©2010 THE CONDÉ NAST PUBLICATIONS. ALL RIGHTS RESERVED.5/36Actor Rob Lowe and his wife, Sheryl, looked to East Coast precedents in designing their California home. “It was inspired by the Virginia-area style,” says architect Don Nulty. Mark Rios of Rios Clementi Hale did the landscaping. Photo: Pieter Estersohn6/36Dating from the 18th century, Rose Hill in Virginia’s Rappahannock Valley was restored by Tidewater Preservation and decorated by Amelia T. Handegan, with garden design by Rieley & Assoc. Landscape Architects. The exterior is painted in a Sherwin-Williams white. © Condé Nast7/36Hilary Geary Ross and her husband, Wilbur Ross, share a home in Southampton, New York, which was decorated by Mario Buatta. The Colonial Revival house was built in the early 1900s.